Formerly in the Fudoki entry as 'Kumoto is 55 feet wide from east to west. Ten large vessels can be anchored here' showing it to have been a particularly good harbor back in ancient times. 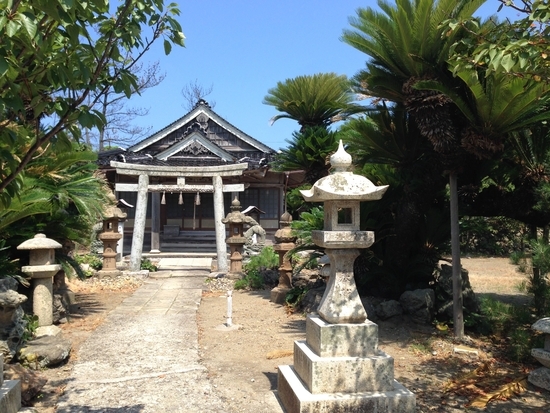 Unfortunately, there is no listing in the Fudoki for the shrine here, however based on the aforementioned, 'east to west' information, this would make Kumotsu harbor located at the easternmost point of the Shimane Peninsula. It would therefore be only natural that it would have had an enshrined deity to protect boats against peril on the seas, in other words, a shrine. Considering the fact that ten shrines are unaccounted for in the existing version of the Izumo Fudoki, it would not be out of the ordinary to conclude that the shrine in Kumotsu is among these omissions. In the present day, Suwa shrine is enshrined in the area, Miya no Hana in the east of the harbor. Previously Suwa-daimyoujin, the framed scripture containing this name displayed in the main shrine was actually the oldest document to be found in the 42 bay pilgrimage. Regrettably, in 1986, some thoughtless individuals who had lit an open fire caused the entire main shrine to be burnt to the ground taking the document with it. Fortunately, the Unyoshi records contained a copy of the scripture and this is a core point of the 42 bay research group. A restored version has been written and is included in the book of 42 bay poems displayed in the current main shrine. It was thanks to the power and unity of the people of Kumotsu that the shrine was rebuilt. Its structure of two halls alongside each other is like that of Miho jinja in Mihonoseki and Miho jinja in Fuku ura. In past days, the order was Suwa shrine to the right with Miho shrine on the left. Suwa jinja is named after the Suwa shrine of Nagano Prefecture. 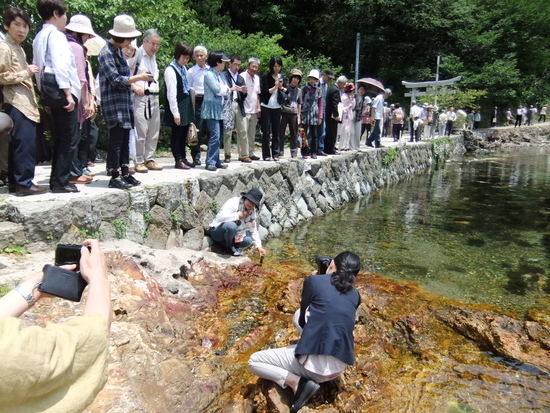 Its pond, which emulates the original Suwa Lake in Nagano, is found between the shrine and the sea. 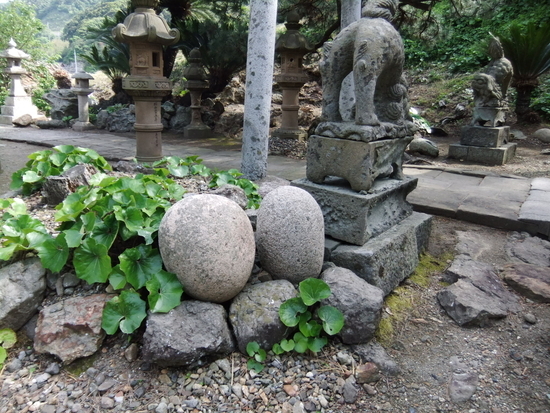 In front of the main building are two stones used for checking a person's physical strength. These are laid in worship before the deity Takeminakata no kami and give insight into the history of the shrine. 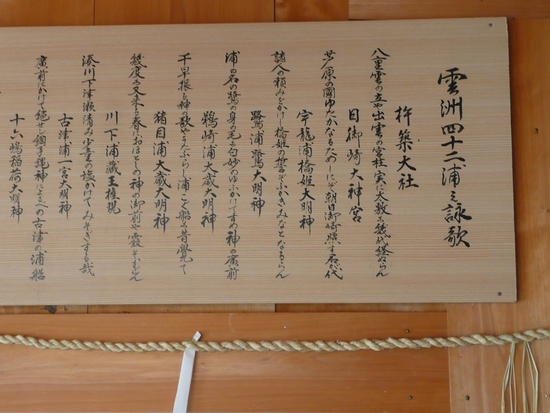 The book of verse that gave rise to the 42 bay pilgrimage, the Unshu 42 ura no eika is displayed in its entirety in the main hall of worship of the shrine. It was the basis for the publication Kumotsu magazine, an original version of which is said to be kept in a private home in the village with one copy in the Shimane Prefectural Library. At this shrine, the Shiokumi (gathering an offering of salt water) ritual is observed by picking up four stones from a rocky area lower down near the entrance to the hall of worship and placing them in twos at one's feet near the Torii gate of the shrine. Taking a roundabout route from the right of the Suwa shrine along the coast brings you to Yadori Cave, commonly known as 'Rokukannon' with a Kannon (Buddhist deity of mercy) statue near the entrance. It is not certain as to when this came to be enshrined here. In the temple at the back of Miho shrine there is an 11-headed Kannon bodhisattva, but it is said that a Kannon was also placed at Suwa shrine as a point of solitude for the kami Kotoshironushi. In the past, when deaths occurred in the Mihonoseki area, family members and relatives would come to this cave and pay respect to the Kannon. These days with falling rocks, it is too dangerous for entry, but prayers for rebirth, Namu Amida Butsu can be seen stuck up along the coastal rocks these days. 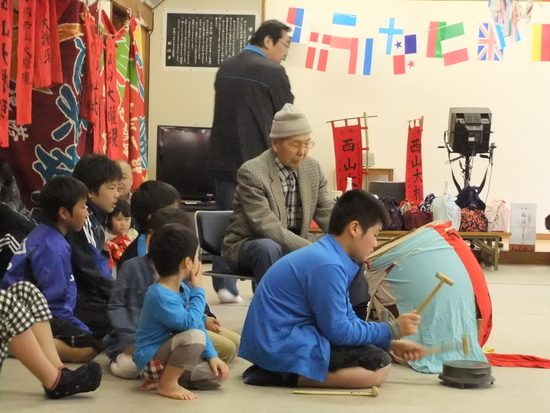 The origins of the children's festival 'Kankara matsuri', held every May 4th most probably go back to the Edo period, but documents from the Meiji era exist with mention of it. "Minamoto no Yoshichika who had been appointed by Tsushima Province at the end of the Heian period, had been exiled to Oki following a rebellion in Kyushu. He escaped from Oki and went on to form another uprising in Izumo. After being hunted down to Kumotsu, he was executed by Inaba Govenor, Taira no Masamori. "According to the fortune telling of the Shugendou mountain priests, epidemics in this area were all down to the fact that it was the location where Minamoto hatched his final malicious plan, hence the continuation of the Kankara festival to calm the evil spirits of Minamoto. The east side of the shoreline north of the Shimane Peninsula currently goes up to Kumotsu, but road construction is underway and before line will reach up to Miho shrine.